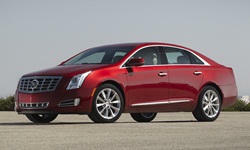 2013 Cadillac XTS Pros and Cons: Why (Not) This Car? The 2013 Cadillac XTS was not supposed to happen. Beginning with the 2003 CTS, Cadillac was abandoning luxo-barges for rear-drive cars designed to beat the Germans at their own game. A third-gen CTS is around the corner, and the new ATS is arguably more of a BMW than the latest BMWs, but Cadillac couldn't escape reality. Front-drive cars that share more with Chevrolets and Buicks cost less to make--and often sell better. So we have the XTS. Any good reasons we shouldn't cynically dismiss it? Why the 2013 Cadillac XTS? A look inside the Cadillac XTS readily dispatches any thought that it's just a tarted-up Chevrolet Impala (the 2014, not the outgoing one well past its sell-by date). Soft two-tone upholstery, contrasting stitching, a band of wood, thick chrome trim, piano black control panels, and two large, vivid liquid-crystal displays combine to deliver a visual tour de force. The aesthetic is too forceful, and the curves too few, to have the warmth of an Infiniti or neo-classic Jag. But there's more visual drama here than in typical German fare. Insufficiently subtle for your taste? Then get the Audi. It doesn't hurt that the materials employed and workmanship are perhaps the best yet seen inside a domestic car. Anything that looks like it could be luxuriously padded is. The wood and metal are the real deal. Most fits are tight and precise, even the complicated area where the multi-layered instrument panel runs into the door (the glovebox being an exception). This was in the Premium trim level. Pony up another $2,500 (over a Premium with sunroof and 20-inch wheels) for the Platinum, and upgraded leather covers just about everything--instrument panel and doors as well as seats--while Alcantara (an expensive faux suede) covers the headliner. Even with an update for 2013, the archrival Lincoln MKS isn't nearly as nice inside. Step inside, and you'll discover another good reason to buy a Cadillac XTS. The large, cushy (but not at all mushy) front seats are among the most comfortable and supportive you'll find in any car, rivaling the best from BMW, Lexus, and Volvo and easily besting the seats in the Audi and Mercedes. The rear seat of the XTS is also quite comfortable--for two people. Basing the XTS on GM's Epsilon platform, originally created for much smaller cars, has a cost. It's much cheaper and easier to lengthen a platform than to widen one. So the XTS is essentially a stretched midsize sedan rather than a large one. Rear legroom is abundant despite insufficient space for feet beneath the front seats, but the cabin is very much midsize in breadth. The compact Dodge Dart (admittedly wide and heavy for its class) provides as much space for shoulders. When I evaluated the Cadillac CTS-V, my superzoom camera rolled around the passenger footwell all week because there wasn't enough space for it in either the glove compartment or center console. I had no such trouble with the XTS. The center console can swallow two such cameras. Among luxury sedans, the XTS's 18-cubic-foot trunk ranks among the roomiest (though the archrival Lincoln MKS can fit another cube, the Audi's is four cubes short). Just be sure to use the Cadillac's cargo net to secure groceries, or you'll be climbing halfway in to retrieve items that have slid forward. It doesn't matter how amazing a car's interior is if the exterior is so boring (or worse) that few people come close enough to peer inside. Well, the exterior of the XTS certainly isn't boring. We�ve got a tall, blunt nose; a high beltline; and a long tail topped by a short deck thanks to C-pillars that just won't quit. With such odd proportions, the XTS isn�t beautiful by conventional standards. Yet I�m intrigued, and find the car oddly attractive despite an inescapable feeling that I should not. Kudos to GM's designers for making such challenging proportions work. Less arguably, the XTS has presence. It stands out. No one will mistake it for a Chevrolet, or anything else for that matter. The ATS should be as distinctive and dramatic. Many consider any Audi tops in its segment for tasteful design. But the A6 appears bland to me (especially with the A7 to compare it to), and not as well-proportioned as earlier generations. For a striking midsize Audi you want the A7, not the A6. I originally had price as a "why not." Depending on one's reference point, price can go either way. Though it shares a basic architecture with the new 2014 Chevrolet Impala, the Cadillac XTS starts at $44,995. The tested XTS Premium with AWD ($2,225), adaptive cruise control ($2,395), 20-inch wheels ($500), and red tintcoat paint ($995)�but without the panoramic sunroof ($1,450) or rear sunshade ($250)�lists for $60,620. Drop the paint and add the missing options, and the sticker checks in at $61,325. Cadillac clearly isn�t fixated on the crosstown competition; a similarly loaded up Lincoln MKS lists for $8,860 less. Adjust for the Cadillac�s additional features using TrueDelta�s car price comparison tool, and the gap is still over $6,000. Compared to a Lexus GS, the XTS is $2,165 less before adjusting for feature differences, and about $3,200 less afterwards. But the Lexus ES might also be considered a competitor, and it lists for about $8,600 less before adjusting for feature differences, and about $7,000 less afterwards. On the other hand, an Audi A6 runs about $5,000 higher, and other German competitors list for about $10,000 more. Many buyers will see at least this much extra value in the German cars. Others might find the Cadillac's lower price a reason to buy it. Why Not the 2013 Cadillac XTS? Hobbled by insufficient low-end torque and tall gearing, the 4,215-pound all-wheel-drive XTS cannot deliver the effortless thrust off the line many American luxury sedan buyers desire, even expect. The 304-horsepower 3.6 does finally wake up at 4,500 rpm, but even if you use the paddles to hold first gear this doesn�t happen until 30 mph. Granted, the engine and transmission in the XTS are far from awful, and many luxury sedan drivers could be completely satisfied with them. But anyone asking for much more than adequate will find them wanting. They are the weakest parts of the car. Boost (available in the Audi A6 and Lincoln MKS) seems the obvious solution. The Cadillac's capable chassis could easily handle another 60+ horsepower. Perhaps the engine and transmission redeem themselves with excellent fuel economy? Well, no. In the EPA's tests, the all-wheel-drive XTS rates 17 mpg city, 26 highway. The trip computer reported 17.5 in suburban driving, close to the estimate, but only 22.7 on a 75 mph run to the airport. At this speed the engine is spinning only 2,000 rpm, but an eight-speed automatic would still help. The Audi A6, with an eight-speed, is rated 18/28. An Audi A7 on the same airport run managed nearly 30 mpg. Only compared to the 18/26 Lincoln MKS (17/25 with EcoBoost) do the Cadillac�s numbers seem competitive. 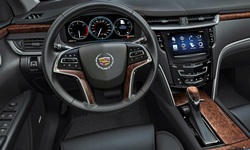 A large LCD in the XTS includes three virtual instruments that can be configured many different ways. They look fantastic, and would be very useful if the optional head-up display couldn't also be configured to project nearly all of the information you need onto the windshield. A second large LCD in the upper section of the center stack houses Cadillac's CUE infotainment and climate control interface. It also looks great, but with a large number of fairly small virtual buttons on many screens can be difficult to navigate and use. I'd like to see home and back buttons on the top left of every screen, as in Chevrolet's less comprehensive but much easier to use MyLink system. Redundant controls occupy the lower section of the center stack. Touch sensitive, these also aren't as easy to use as conventional knobs and buttons. But, at least until finger prints smudge it up the piano black panel looks sleek and upscale. Though far from paragons of simplicity themselves, the Audi's controls are easier to use. The XTS rides much more like a sport-suspended Audi A6 than a traditional Cadillac. Those who prefer well-damped control to cushy float will find it comfortable. But some people will wish for cushy float. Unless the somewhat unrefined V6 is being prodded towards its power peak, the optional 245/40VR20 Bridgestone Potenza RE97 all-season tires are the largest contributor to the small amount of noise that manages to penetrate the cabin. I originally had handling as a "why." Like price, this attribute can go either way depending on one's reference point. Given that the XTS is based on GM's volume, front-drive platform, anyone seeking a midsize Cadillac that handles should wait for the next CTS, right? Well, GM's chassis engineers didn't get the memo. They fitted every XTS (not just the upper trims) with a radically modified strut front suspension to minimize torque steer and maximize front tire grip, Magnetic Ride Control dampers to control body motions, rear air springs to keep the car level, an active rear differential (with the Haldex AWD system) to help the rear end round curves, and Brembo front brakes. Complicated technology often can't compensate for a fundamentally flawed chassis (e.g. the Lincoln MKS and many pre-2003 Cadillacs). But in the XTS it does the trick. When hustled, the XTS feels more balanced and composed than the rear-drive Mercedes-Benz E-Class and far less clumsy than its Taurus-based archrival. Dip into the throttle with the wheel turned, and there's even some oversteer. The non-defeatable stability control system kicks in before things can get out of hand, but it has a fairly high threshold. Unfortunately, one system was left out of this aggressive mix. The XTS's steering is light and (typical of luxury sedans) fairly numb. Also, while its chassis is well-behaved, the XTS feels large. Forward visibility might be less restricted than in the related Buick LaCrosse, but this isn't saying much. Partly because of its firmer steering and less restricted outward visibility, the Audi provides a greater sense of control and generally handles better. But its edge is smaller than I expected. The Cadillac XTS is a much better car than I expected it to be. It looks the role, has comfortable seats within a lavish interior, and even handles well enough that absent steering feel is missed. The controls could be easier to use, but they look great. The main things the XTS needs are a stronger engine and better steering. Most drivers will find the current powertrain sufficiently strong, just not fuel efficient. For others, a turbocharged 3.6-liter V6 will be offered in the 2014. Cadillac provided an insured car for a week with a tank of gas. 2013 Cadillac XTS pros and cons, according to Michael Karesh: the best reasons for buying (or not buying) the 2013 Cadillac XTS. Join TrueDelta to post your own impressions.